I have recently visited the fantastic city of Hong Kong. With a direct flight from Cathay Pacific from Schiphol Amsterdam, you will find yourself in the heart of this cool and vibrant city in less than 12 hours. After a comfortable flight and tasty food on board, I entered a totally different world. From my window seat I enjoyed an impressive sunrise at arrival. Since the airport lies in the mountains, it gives you a good view over Hong Kong. This city was beyond my expectations and for the first time ever on a trip, I wasnâ€™t able to see everything I wanted. I was already told by many people to bring enough memory cards and I'm glad I did ;) There is just so much to see and do, and with so many unique spots to photograph, it is a photographers paradise. Therefore, I want to share these gems with you. If you ever want to visit Hong Kong, I think these are places that are definitely worth the visit. Of course, there are many more beautiful spots that I havenâ€™t been able to see, so if you have any suggestions for cool locations, please let me know in the comments below! First of all, there is Hong Kongâ€™s famous skyline. From the Tsim Sha Tsui Promenade this is a good place for a stunning shot. Every evening at 20:00 you will also find a light show where the buildings are exposed to synchronised music: A Symphony of Lights. This location is great for night photography, but also good for a sunrise, so well worth a visit! The boats here sail off and on and even photographing tourists with their selfiesticks alone, are worth photographing here! 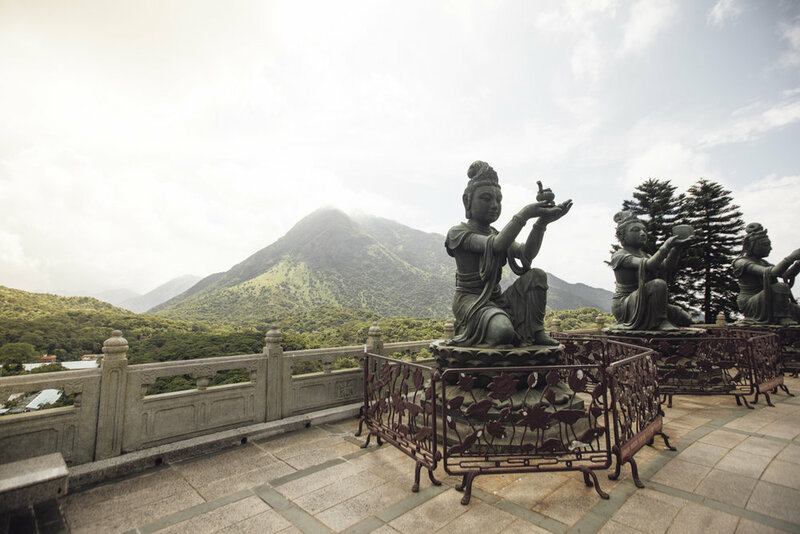 Within two hours by metro and bus, you will find the famous Tian Tan Buddha, which is located on Lantau Island. Being the largest sitting bronze Buddha in the open air and one of the five great Buddha statues in China, obviously this statue looks quite spectacular even from a big distance. You can also get there with the Ngong Ping 360 cablecar. But before they start running, you can also the bus -like I did- to avoid the first crowd of tourists. This way you are able to shoot beautifully calm and quiet pictures without many people in it. During the journey, you will find that the surroundings suddenly completely change, itâ€™s great to see the beautiful nature that Hong Kong also has to offer. I would advise you to first visit the -then still quiet- adjacent Po Lin Monastery, to then to climb the 268 steps up to the imposing Buddha. The view is magnificent, from here you will also have some magnificent views on the islands and the monastery. Tip: take a good telelens with you. There are enough interesting subjects to see in the distance. The impressive Tian Tan buddha on Lantau. Looking at the trees, you get an idea of the size of this huge structure. The almost desolated Ngong Ping Piazza in the early morning. 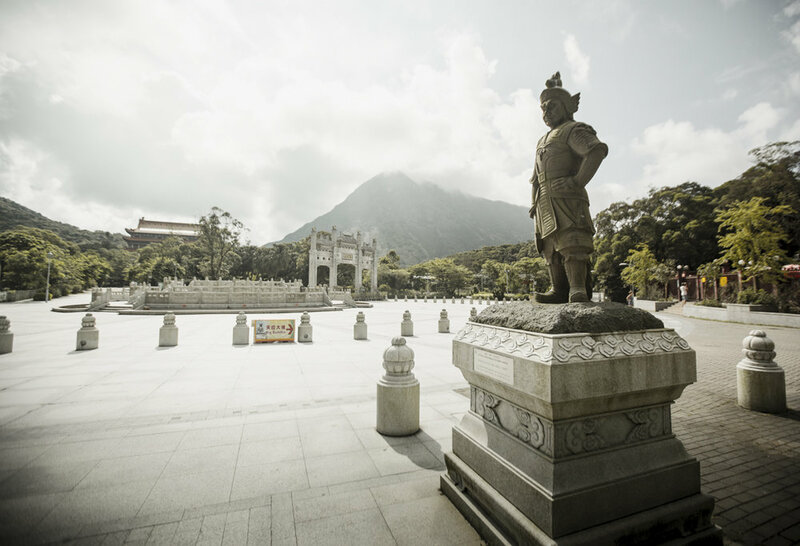 One of the 6 buddhistic statues praising and making offerings to the Tian Tan Buddha. 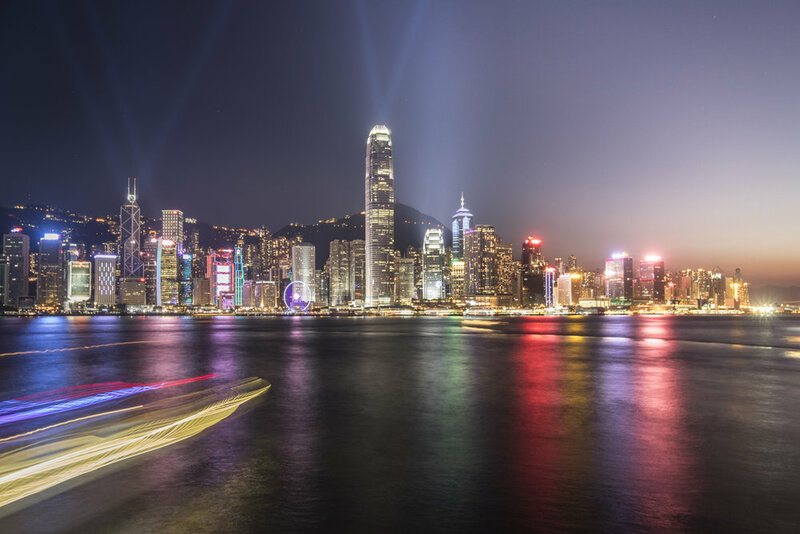 Hong Kong is a city of many beautiful views on the skylines. There are a lot of rooftop bars with the most beautiful views you can wish for, so I had to visit some of them. Unfortunately I couldnâ€™t see everything in a week. ;) The first one I visited is The Aqua Restaurant, near Tsim Sha Tsui at Kowloon. 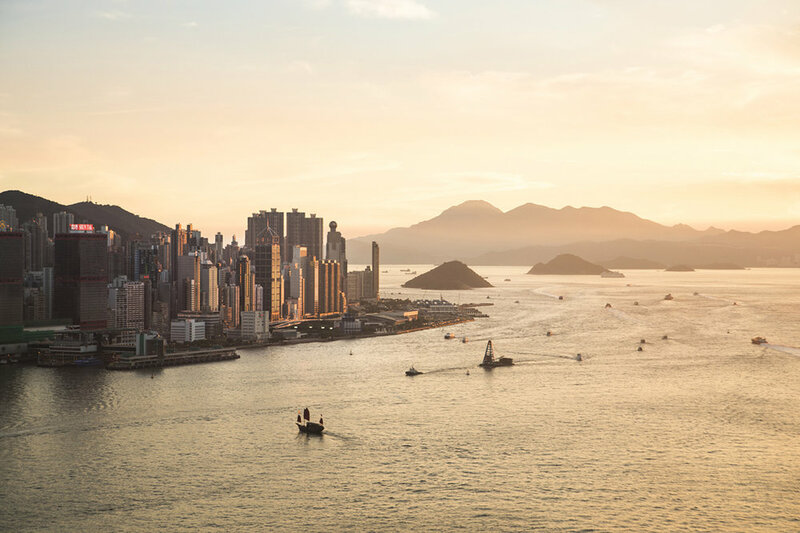 From here youâ€™ll have a great view on the skyline in Victoria harbour, but also, enjoy a sunset in the mountains. So, sit down and relax, enjoy your cocktail at the rooftop bar while your sunset time-lapse is being created, or enjoy one of the delicious dishes that this seafood restaurant has to offer! Stunning views from Aqua over the skyline and its surrounding islands in a sunset. 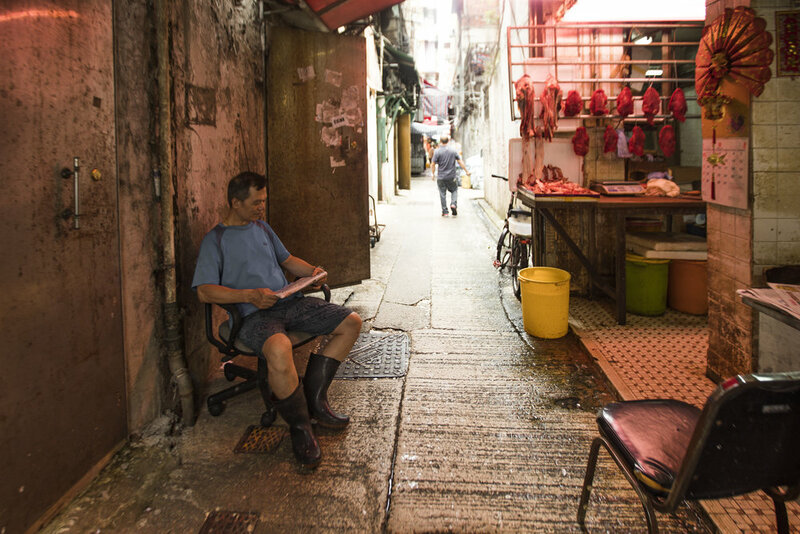 Not far from the famous Ladies market, you will find Mong Kok Market where they sell meat, fish and vegetables. I personally found this such a photogenic market, mainly because the locals buy their ingredients here and you simply wonâ€™t see many tourists. 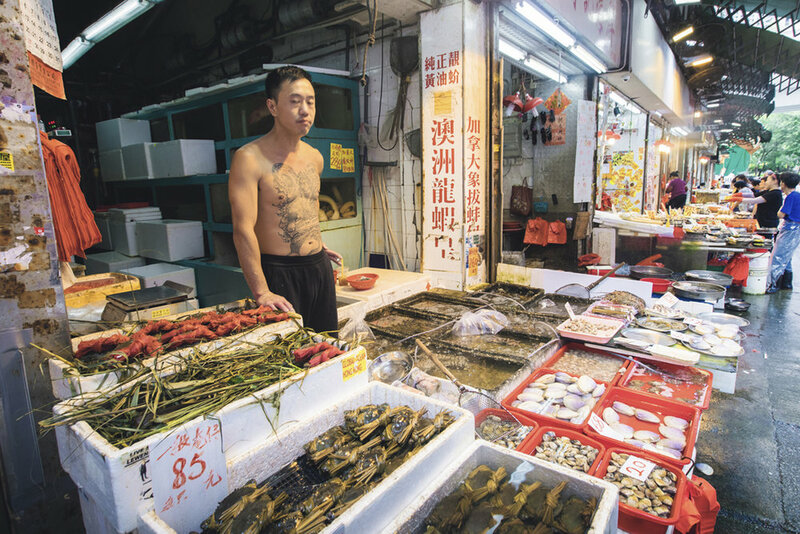 The fresh products (the fish jumps out of the buckets), the liveliness of the market, the people, I really got an authentic Hong Kong feeling here. So beautiful to see how everything is passionately prepared and sold here. One of the narrow alleys of the market. On Hong Kong Island it is a busy street life with big crowds of people and lots of traffic. How cool is it that you can exchange that chaos for a quiet spot with skyline view and sunshine? From a busy street in Wan Chai, you can go up by elevator to the the 31st floor to the Wooloomooloo Steakhouse, to end up in another world! With the calm noise of the traffic in the background and with a refreshing drink in your hands, you can watch the sunset from a totally different perspective. I would definitely recommend this spot, since you can take breathtaking photographs from here! Looking east on Hong Kong island. View on the skyline to the west on Hong Kong island. 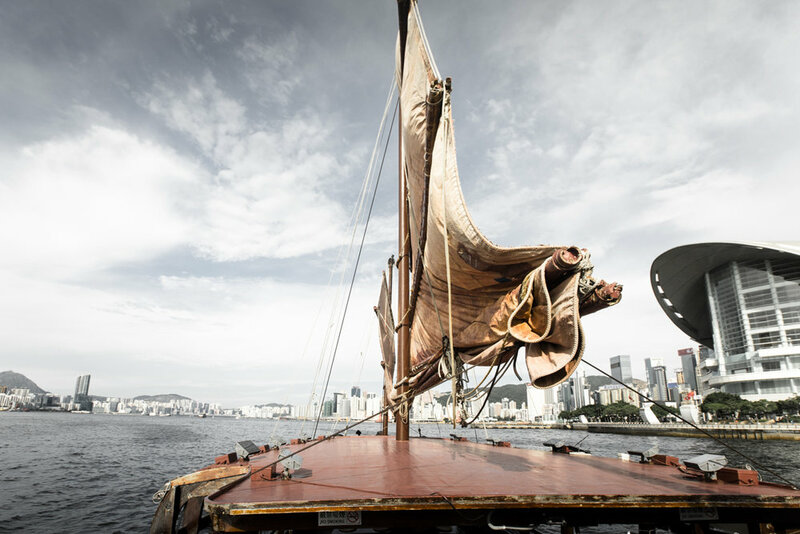 An experience I think you shouldnâ€™t miss, is a boat trip with the iconic old Dukling sailboat. This amazing photogenic boat can be seen from the harbour every day, but actually be on it, is even more fun. Witness the Victoria harbour from the water and let the waves take you to great sceneries on this historic fishing boat. The boats leaves from the Sha Tsui pier where the light shows take place and you can easily buy your ticket on departure. Or book online to also find more information. I would definitely recommend going for a sunset sail, the trip is great for photographing at that time of day. Looking at the riverbank of Victoria harbour. Looking at the 490 meters high skyscraper is quite impressive, as well as from the water. After all the chaos in the city, it is also nice to have a break in Hong Kongâ€™s natural surroundings. There are many nice islands in the area where you can go. I went to Tai O, a traditional fishing village, which lies in great contrast with Hong Kong. The village is a photographers dream and definitely worth the trip from Hong Kong. It is partly on an island carrying the same name, with the rest of the village is on Lantau. Within 2.5 hours by metro and bus you will find yourself in this authentic village, which is famous for its dried salty seafood, shrimp paste and fish culture. Here you can easily wander around over the wooden paths between the traditional houses on poles, visit the street market or a temple. This place will never bore you. But Tai O is also the place to see the unique pink dolphins. A watching tour first takes the boat along a scenic ride along the cottages to then set off to the open see to catch a glimpse of these rare pink animals. Tip: Make sure you take stabilised video recordings. The moment of seeing them passes by so quickly. They often appear in a great distance and taking a focused photo is then quite a challenge. But it surely is very amazing to see the animals for yourself though, wow what a great experience! 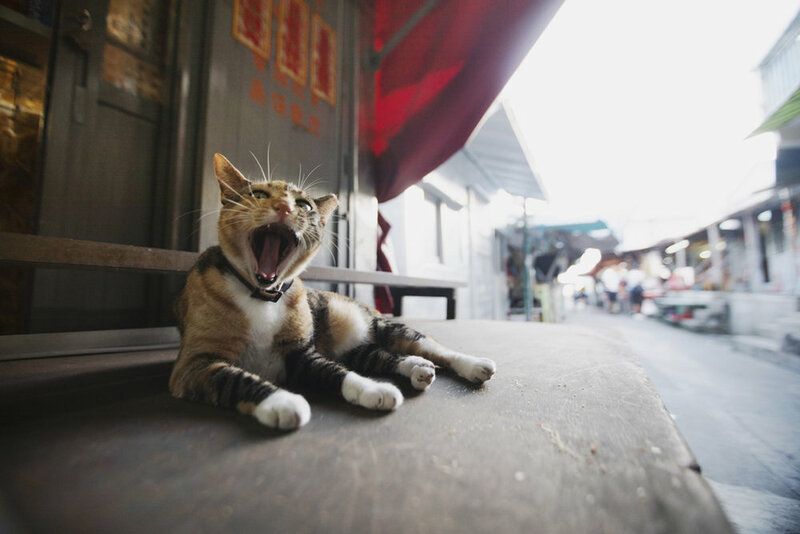 Tai O fishing village lies in the western coast of Lantau island. The boat that takes you on the Pink Dolphin Tour. The stilt houses in Tai O. Night falls at the Peak. 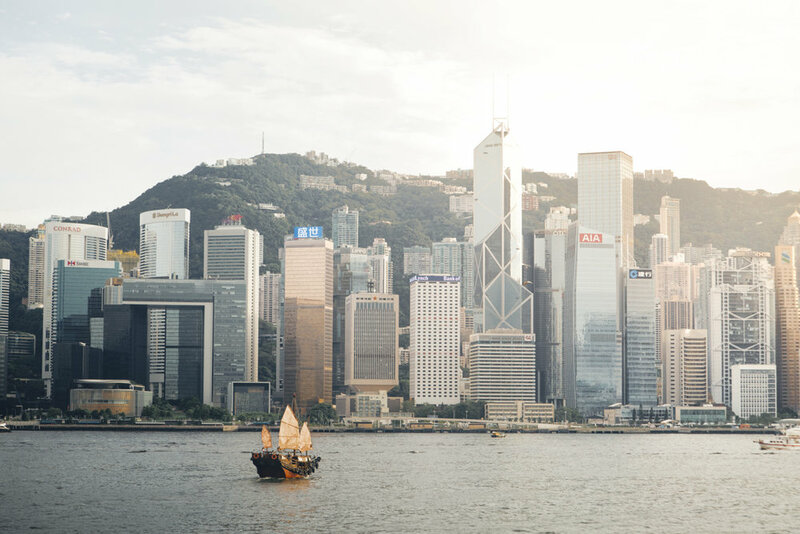 This journey is made in partnership with Cathay Pacific and the Hong Kong Tourist Board. Book your tickets for traveling in style or find more information about your flight to Hong Kong here. 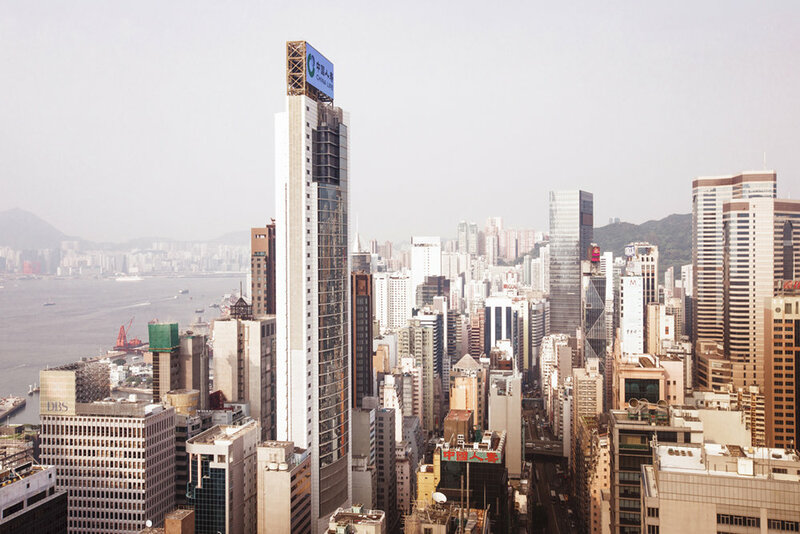 If you would like to find out more about the city and its surroundings, please go to Discover Hong Kong.